What are Chrome extensions and why should I try them? 1. Chrome extensions are an excellent way to extend the functionality of your Chrome web browser. 4. Extensions can be easily enabled and disabled through your Chrome settings. Please contact me at the Help Desk at extension1936 or book an appointment with me at jscheffer.youcanbook.me if you would like additional assistance using Chrome Extensions. 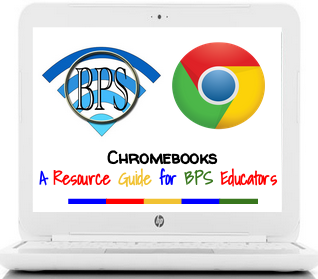 You can can also check out my BPS Con presentation: Level Up Your Chromebook with the Chrome Web Store, Apps, & Extensions. With the Giphy extension for Chrome teachers and students can search for animated GIF’s and add them to their Google Docs, Presentations, or directly to a Gmail message. Simply drag the animated GIF and watch it animate automatically. Access Google Scholar from any web page with the Google Scholar Button extension. Find full text articles and easily grab detailed citation information in a variety of popular formats. As a bonus you can download your completed bibliography. Reviewers state how much time they save during this research process with this powerful extension. The award-winning Citelighter allows student researchers to highlight and capture pictures, PDF’s, and webpages for their APA, MLA, or Chicago style format research. The organizational features of this intuitive extension helps students manage complex research and writing assignments. The Google Dictionary extension allows you to view the definition of any word in a small pop-up window just by double clicking on the word. Foreign words will be automatically translated in the language of your choice. View complete definition in the dictionary toolbar. Questions about Chrome extensions or your Chromebook in general? Feel free to book an appointment with me at jscheffer.youcanbook.me or you can check out the website Chromebooks: A Resource Guide for BPS Educators to learn more about your HP Chromebook. ← Donny & Kevin Take on Gillette!